I used 8 ounces (227 g) of linguine which serves 4. In a large bowl mix first the lime juice and salt until salt dissolves. Then combine the oregano, olive oil and pepper. Add the shrimp and coat with the mixture. Set aside in fridge. In a blender or food processor, combine all the above ingredients and blend on low until it makes a paste. Empty pesto into a bowl. Fire up a grill or large skillet to medium-high heat. Grill the shrimp 1 to 2 minutes each side until cooked through. Combine cooked pasta with the pesto. Serve pasta topped with shrimp. Me too. Thank you, Mila! Sounds delicious…I like you use of sunflower seeds in the pesto. I need to try growing arugula again…last year it bolted right after I planted it. Thanks, Karen. I hear arugula is not easy to grow and not easy to harvest either. Oh wow. This dish looks gorgeous!!! Your photography is always impeccable Liuba. Can’t wait to try this! Thank you for the compliment, Laura! And congrats on your one-year blognniversary. Time flies when your cooking fun, doesn’t it? shrimp. Definitely going to grill the shrimp. My iron grill is the best purchase I’ve made so far for my kitchen cookware. I use it practically every day. I just bought more shrimp yesterday to make this recipe again. So I take it, this was definitely a winner in your house too. So is your grill an indoor, electric grill? I was thinking of the one outside (just putting the shrimp in the wire basket). I’ve wondered how those other grills are. It’s an indoor grill you put over your stove burners. Definitely I think outdoor grills are better and easier to clean because they sit over an open flame. My indoor grill is more like a flat skillet but still works well. Just not easy to clean. It’s heavy and the food sticks to the grill sometimes. Maybe I’m not cooking it right. I’ll have to read up on how to keep the food from sticking to the grill. By the way, your blog is beautiful blending culture, travels, and food! Thank you so much! I am new at blogging but loving it so far. I love all your recipes too! Thank you Virginia. One of the places I hope to visit in my lifetime is England, including London and the country. Looks yummy! 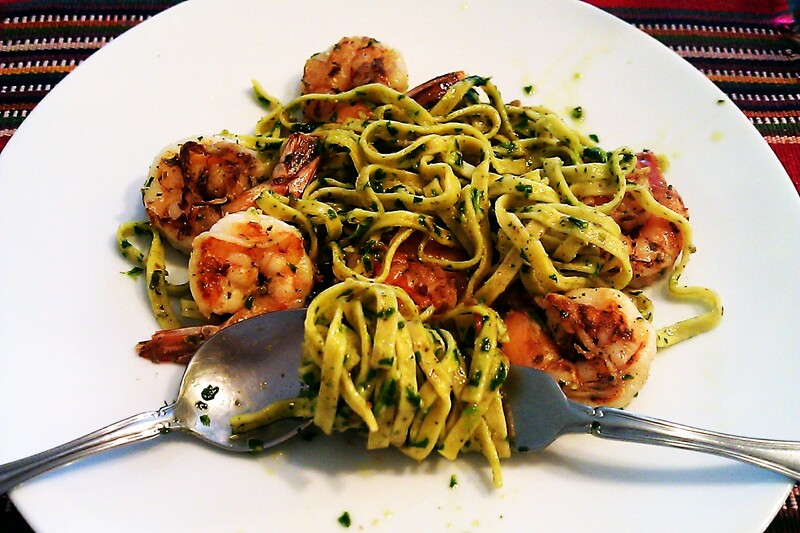 Love shrimp and pesto together. Lovely post. Thanks, it’s good. So good I’m making it again. This looks AMAZING! It’s after giving me an appetite now! Must try this recipe sometime! Thank you! I’m going to make it again it turned out really good.